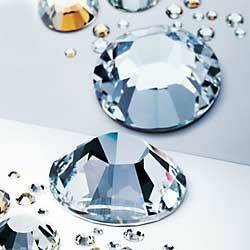 Swarovski's Flat Back No Hotfix (NoHF) are loose crystal components. They have a platinum foiling on the back, giving them extra brilliance and protection. They are easy to apply. We will collect a list of product items here for you for your easy reference. They will be sorted by their Codes. Not every flat back crystal has a name but when they do, we will include it. Click on the code-link for more details of each flat back crystal.